This past week, the Langkilde lab headed out to Raystown Field station to catch some Eastern Fence Lizards (Sceloporus undulatus). 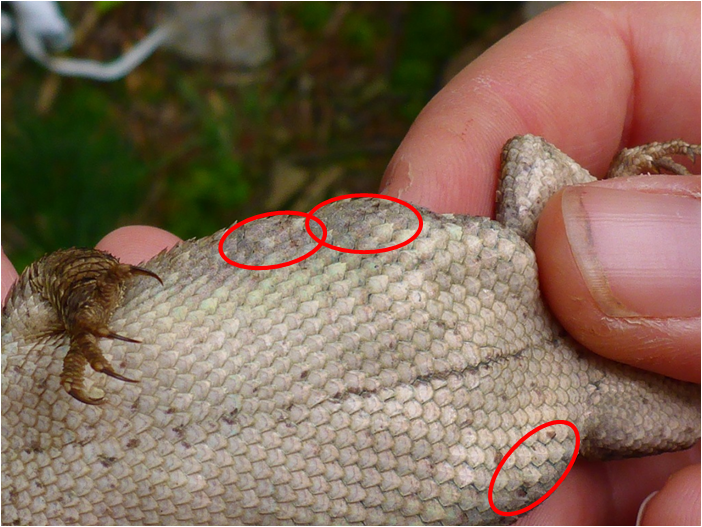 We were catching lizards to record their morphology (limb size, weight, length, etc.) and to take blood samples. We took blood samples to measure their levels of a stress hormone, Corticosterone, or CORT. We wanted to catch around 20 lizards and take blood samples at various intervals over a range of 0-10 minutes post-capture to get a nice range of blood sampling times. With this range of times, we hope to find the approximate time-point at which a lizard’s CORT levels spike; is it 1 minute, 2 minutes, 7 minutes post-capture? Basically, we are just trying to better understand stress in reptiles, which is an area that isn’t well understood or explored yet. Understanding the manner that stress operates in these lizards can provide insight into how anthropomorphic stressors such as habitat destruction affect the lizard’s health and stress levels. While our primary goal was to catch fence lizards, we found lots of other interesting animals along the way. Read below to follow our day’s journey in the wilds of South Western Pennsylvania! We left State College around 9:15am to head down to the Raystown Lake Field Station in Huntingdon County. While the skies in State College were gloomy and overcast, as we got closer to our destination, the skies began to clear and we enjoyed what became a wonderful and sunny Tuesday afternoon. No more than 10 minutes after our arrival at Raystown Lake Field Station, we stumbled across our first herp (reptile or amphibian) of the trip! 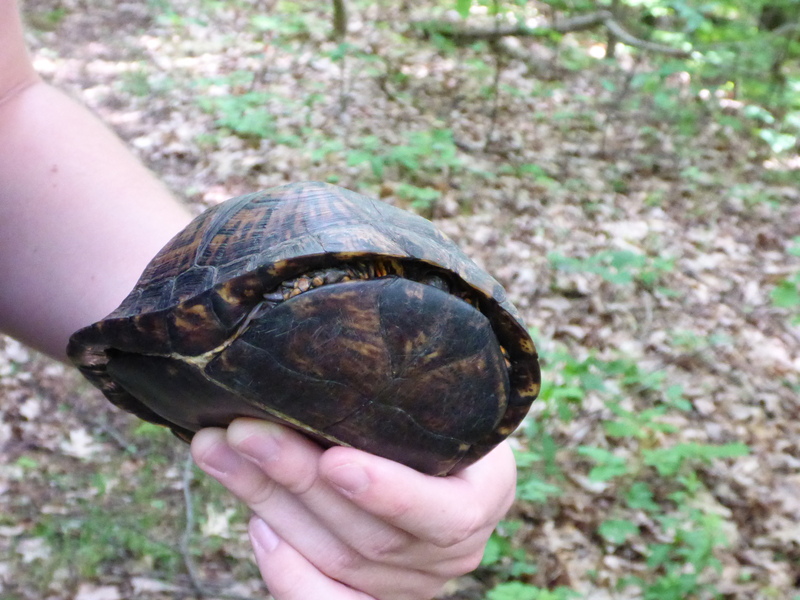 A pregnant female Eastern Box Turtle (Terrapene carolina carolina) which we found wandering around behind a wood shed only 10 minutes after arriving at our destination! After we finished checking out the box turtle, we began our trek up the mountainside, hiking for about 25 minutes at a 45 degree incline (it was fairly tiring carrying all of our gear). Once we had finally made it to the ridge top where we would begin our hunt for lizards, we were greeted by another Eastern Box Turtle, but this time it was a male. 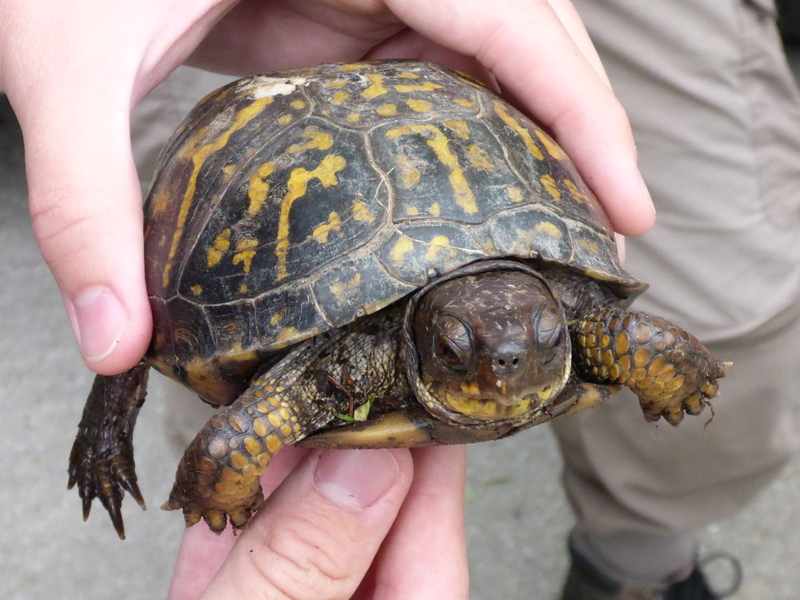 Male Eastern Box Turtle (Terrapene carolina carolina). Note how much brighter the orange coloration is compared to the female above. 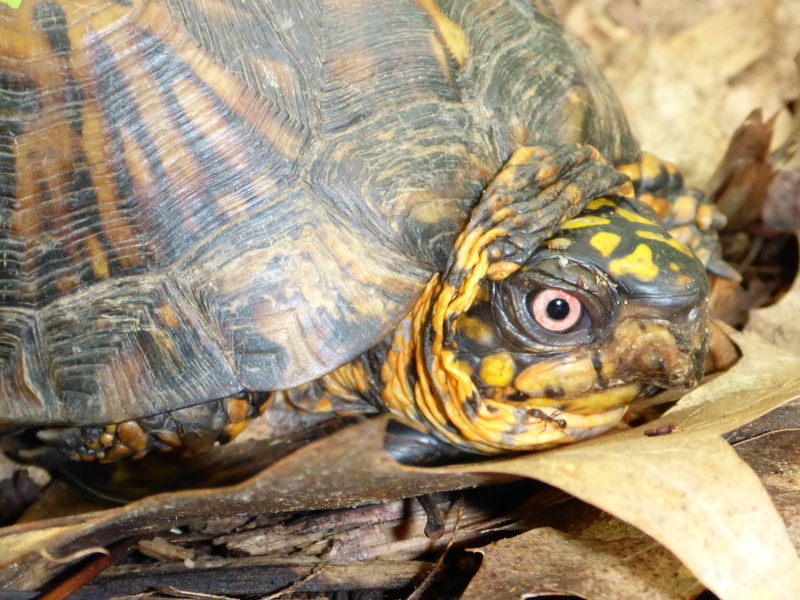 Box Turtles are so named because of their unique defense, as seen above. They have a hinged plastron (bottom shell), which allows the turtle to nearly completely close off his interior from predators, making the appearance of a box! A little way up the trail, we chose a nice flat and sunny spot to set up our base camp, split up into lizard catching groups, and make sure that we had everything organized and ready to go. 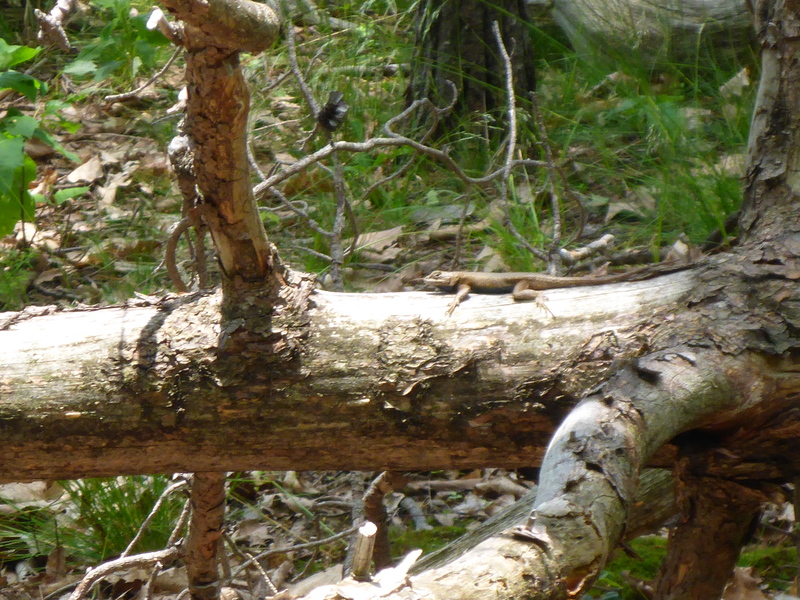 While getting settled, I looked around and noticed a yearling lizard just sitting on a large fallen tree only a few feet from where we were standing. A few second later, we heard some scuttling in the leaves and witnessed some brief mating between an adult male and female Eastern Fence Lizard (Sceloporus undulatus), but unfortunately we could not get any good pictures or video before they went their separate ways. 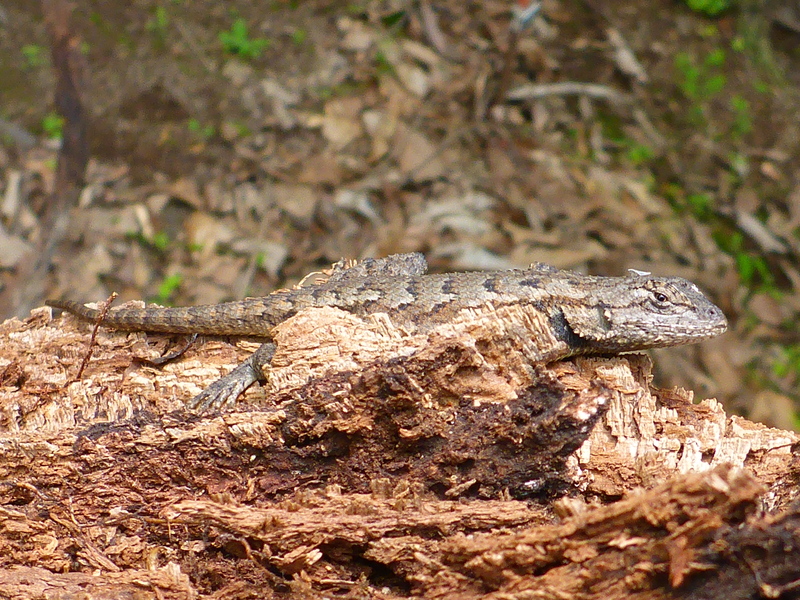 Prior to this photo, this male Eastern Fence Lizard (Sceloporus undulatus) was mating with a nearby female. Here, you can see him basking on the log to heat up for the day. If you look closely at his lower neck and stomach, you can see some of his bright blue coloration! After we finished prepping, we finally set off in our two groups to begin catching some fence lizards, which, afterall, was the purpose of our trip. 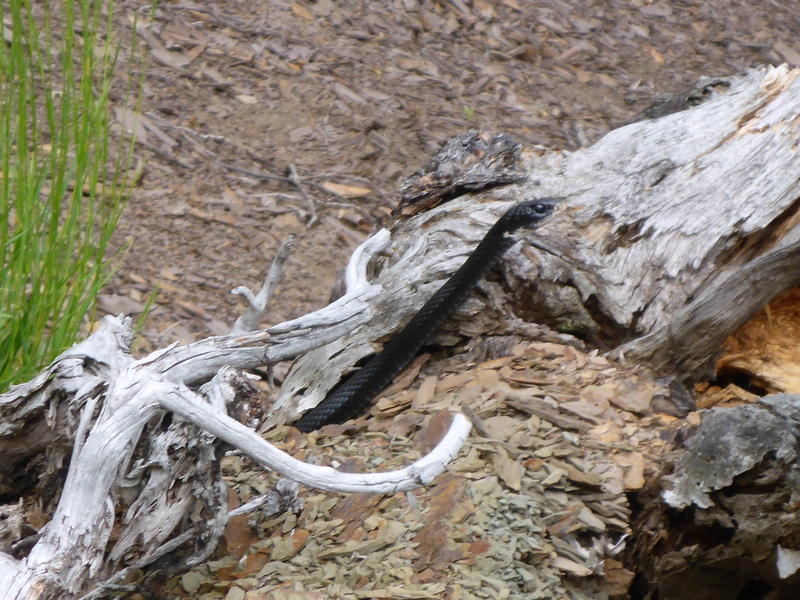 However, in addition to fence lizards, we stumbled across a few other interesting animals (and of course some fence lizards). 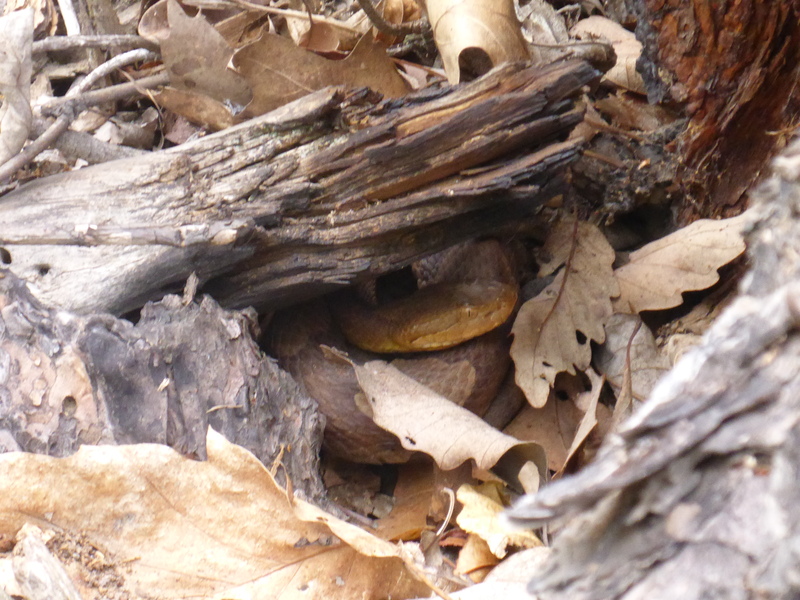 Nestled up under a fallen tree trunk, we stumbled across a Northen Copperhead (Agkistrodon contortrix mokasen). We found him right next to a lizard that we had just caught, and thankfully we saw it before we accidentally stepped too close. 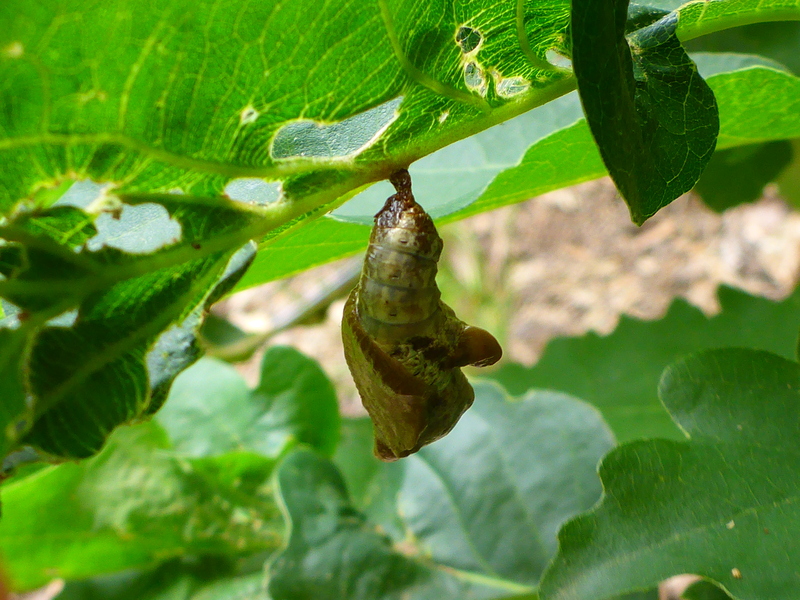 A chrysalis found hanging from a small plant. I wonder what is going to emerge from it? In our searching for fence lizards, we managed to find one of PA’s other native lizards, the Common Five-line Skink (Plestiodon fasciatus). 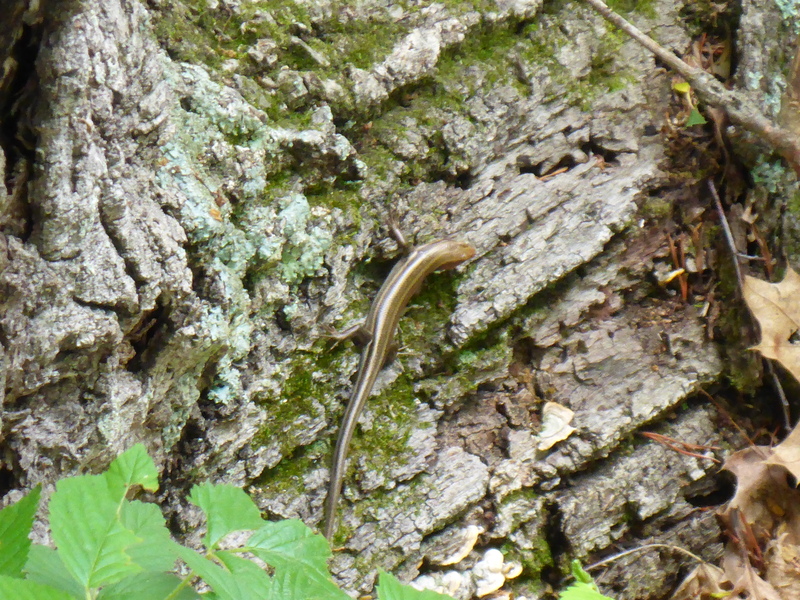 A Common Five-lined Skink crawling along the side of fallen tree that we found him basking on. 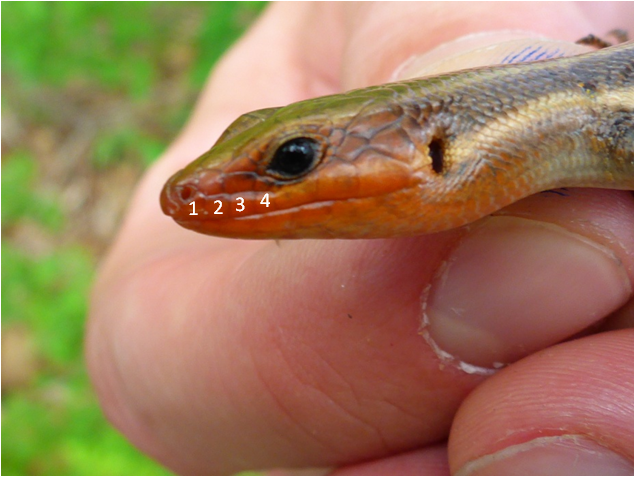 There are two other skink species in PA, but we were able to identify our skink as a Plestiodon fasciatus because it had 4 supralabial scales (above the “lip”) before the scale immediately below the eye. 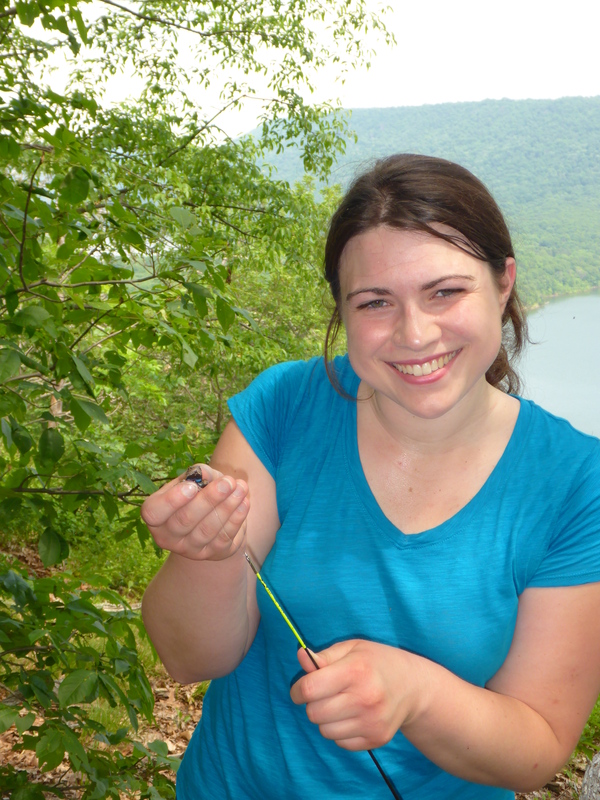 Melissa, a student researcher in the Langkilde lab, posing with the first Eastern Fence Lizard she ever caught! After we had caught the lizards that we needed and taken the blood samples, we reunited with our other group of lizard catchers to start recording the morphology of the lizards. While recording measurements for the lizards can be a little boring, we try to keep ourselves entertained throughout the process. Chris posing with one of the Fence Lizards that we caught during the day. Most of the Fence Lizards we caught that day were on the smaller side, but we did catch a few large ones, including a big pregnant female which we jokingly referred to as Godzilla. “Godzilla”, the large female Eastern Fence Lizard we caught during the day. Godzilla’s belly. The red ovals highlight the approximate locations of some of her eggs. She was probably going to lay in the next week or two. 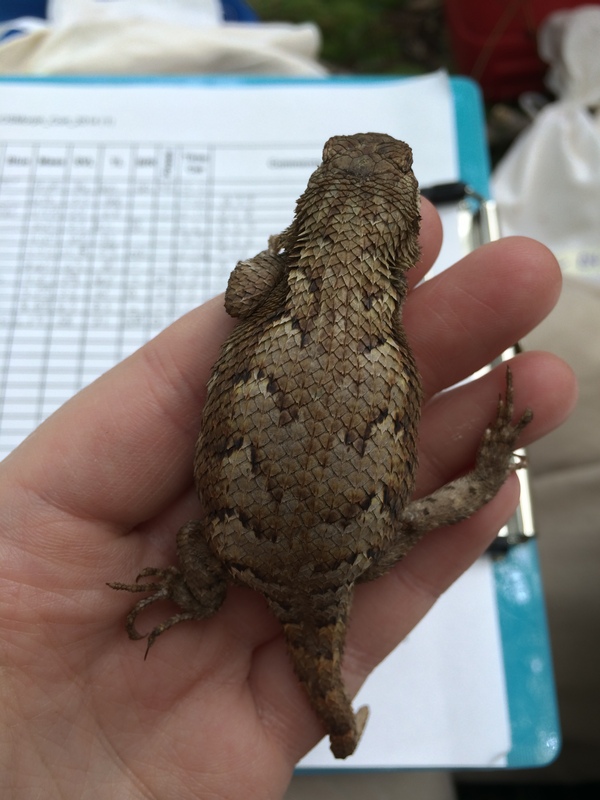 Once we had measured all of the lizards and collected all of the blood samples that we needed, all of the lizards were released at their points of capture. While releasing the lizard we caught near the Northern Copperhead earlier in the day, we were surpised to find another snake hanging around the tree trunk. A Northern Racer (Coluber constrictor constrictor) which we found at the same tree trunk as the Northern Copperhead. As we got closer, it retreated inside the tree trunk. With all the lizards returned and all of the blood samples packed away on ice in our coolers, we headed down the mountainside to return to our research van. 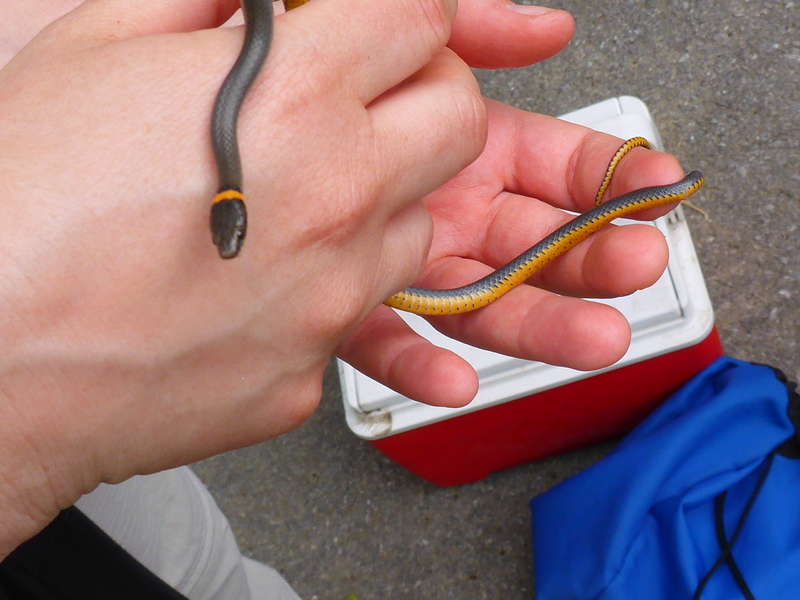 As we packed up our belongings to make the trek back to State College, we found one final herp, the always beautiful Northern Ring-necked Snake (Diadophis punctatus edwardsii). A Northern Ring-necked Snake (Diadophis punctatus edwardsi) which we found right before leaving Raystown Lake Field Station. 1 trip, 6 herp species, 21 lizards, and a tired bunch of researchers later, we found ourselves back at Penn State, having succeeded in what we set out to do. 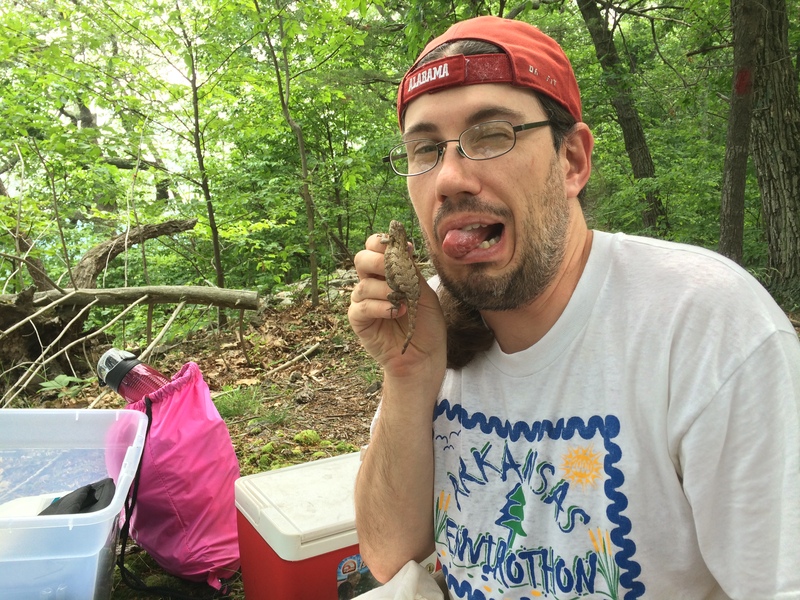 We’ll be heading out to Raystown Lake once or twice more in the coming weeks, so be on the lookout for an update on our next PA Lizard Catching Adventure! Categories: Fun in the Field, Research in PA | Tags: box turtle, copperhead, fence lizard, ringneck snake, SEECoS, skink, stress | Permalink.